It has been a pleasure to serve as YBTT Chair for the last three years. Today, I am honoured to report to you on our progress over the period 1st October 2016 to 30th September 2017. I am delighted to begin my report by acknowledging Shedron Collins, our General Manager, and each of our team members for their engagement, professionalism and team-spirit over the last year. I especially want to thank the Board of Directors for their involvement, dedication and support for YBTT and for me, in my role of Chair. My remarks will reflect our GEW 2017 theme, “Entrepreneurship as the Game-Changer”. 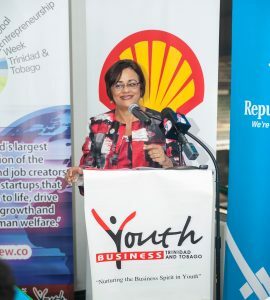 I will comment on the state of play as we co-create a culture of youth entrepreneurship in Trinidad and Tobago; review the value of the contributions we’re making as YBTT; and comment on our 2018/2020 strategic outlook. The game is fast-moving, constantly evolving and we, at YBTT, are in its midst. Our 17-year legacy as well as our more recent investments in developing our people, sharpening team focus, expanding our strategic networks, and building internal capacity have positioned us as a high-potential player and a valuable partner to entrepreneurs, donors and other entrepreneurial eco-system stakeholders. There’s no single clear-cut linear game-plan that will create the culture of entrepreneurship to which we and other stakeholders aspire. Like the entrepreneurial journey, success lies in a series of co-ordinated movements – experimentation, iteration, adaptation, failure, refinement and resilient pursuit of the goal. For us, at YBTT, continuing focus, learning, and agility will remain our ground rules as we play our part to intensify the co-creating work required to accelerate the emergence of a vibrant entrepreneurship sector in Trinidad and Tobago. Our quality interventions to support Young Entrepreneurs (YE’s) and to strengthen economic development through nurturing entrepreneurship, innovation and meaningful employment, are needed more than ever. As our YE’s succeed and scale, they will expand the country’s SME sector, creating new technologies, sustainable solutions and becoming the nucleus for the development of tomorrow’s conglomerates and multi-nationals. This is what makes entrepreneurship the game-changer – its potential to catalyze Trinidad and Tobago’s economic recovery, future prosperity and social stability. We celebrated our 17th year as an NGO, having launched in February 2000 with a Mission to nurture the business spirit in youth and a Vision to play a leadership role in developing a culture of entrepreneurship among young people in establishing sustainable businesses in Trinidad and Tobago. Initially our focus was on providing loans and mentorship to YE’s who “would not otherwise have the opportunity”. Some survived beyond the start-up period, scaled up, created employment and are now successfully running their own businesses. Over the years, however, a broader definition of ‘under-served’ emerged – there were growing numbers of young people becoming interested in entrepreneurship who were ill-equipped financially, experientially and emotionally for the challenge. Also, there was an intensifying national and regional conversation around entrepreneurship, and, particularly, youth entrepreneurship. Over 2015/2017, we pursued four key operational priorities: (i) To improve and scale our suite of financial and non-financial support services; (ii) To build strong and effective partnerships and increase our influence as a support organization through advocacy – working with policymakers and others in the ecosystem to create a more enabling environment for entrepreneurship; (iii) To increase awareness of the YBTT Brand and (iv) To enhance our internal capacity to both strengthen current performance improvement and future sustainability. In late 2017, the Board and staff members began the process of co-creating our 2018/2020 Strategic Plan. Board members and staff formed a united team to chart our future course. Our conversations were vibrant, fun, insightful and energizing. The final document will be completed by the end of March 2018. Since inception, YBTT’s strength has lied within its ability to create powerful support networks. In 2017, we strengthened existing relationships and created new ones. We were awarded a 3-year unconditional reaccreditation from the UK-based Youth Business International (YBI), of whom we have been a member since 2000. For the eigth consecutive year, we hosted Global Entrepreneurship Week, securing the collaboration of 26 local partners. In addition, we collaborated with civil society members within the SDGs Catalysts Network and re-energized our involvement in the Commonwealth Alliance for Youth Entrepreneurship within the Caribbean and Canada (CAYE-C&C). One of our proudest moments in 2017 and the outcome of many hours of preparation, was the launch of our inclusion in the Shell LiveWIRE global network. The Shell LiveWire programme expands our traditional support services to include business acceleration support, access to SHELL LiveWIRE international platforms and market linkages, and includes opportunities for participating YE’s to supply Shell’s value-chain. Overall, our shared intention is to align our efforts to national economic development strategy by supporting YE’S to build out new industries in the areas of Energy Solutions, Recycling & Waste Management, Agriculture, Hospitality and Eco-Tourism. In 2017, three YBTT-supported entrepreneurs, Brian Benoit, Deidre Lee Kin and Maria Boneo, were among 20 applicants within the global Shell Top Ten Innovators Competition. At the November launch, Maria was celebrated as the winner of the Merit Prize. The programme will be one of YBTT’s priority projects in 2018 and beyond. At the national level, the focus will be on existing entrepreneurs who have the potential to grow and who operate within the Energy Solutions, Recycling & Waste Management, and Agriculture sectors. In Tobago, we will focus on eco-tourism and hospitality businesses. YBTT’s involvement in the Youth Entrepreneurship Programme for Latin America and the Caribbean (YEP) deserves special mention as we benefitted from the YEP programme in several ways. One of the most significant was the provision of a CUSO International Technical Advisor, Femi James, on a 12-month institutional strengthening consultancy project. During this period, she completed a comprehensive Institutional Needs Assessment covering organizational, administrative and operational perspectives; compiled an Action Plan for YBTT; then worked with us to execute it. The next steps include the completion, by the end of April 2018, of a Harmonized Entrepreneurial Training Programme that will create shared curriculum and training delivery across three regional YBT’s, Trinidad and Tobago, Barbados and Jamaica. One of YBTT’s entrepreneurs, Kerron Modeste, of Modeste Home Growers Company Limited, emerged as one of 3 finalists for the YEP awards 2017 and attended the YEP regional conference in September 2017. Over the years, YBTT’s success has been fuelled by the quality of our relationships. We appreciate deeply the generous support of our Donors. Their contributions continue to make it possible for us to help YE’s to fulfil their dreams and play their part in the country’s social and economic development. In 2016/2017, we received funding from Shell Trinidad and Tobago, from the International Development Bank (IDB) through YBI and from CIBC/First Caribbean International Bank, Republic Bank Limited, the Neal & Massy Foundation, United Way/Citi Foundation, CUSO International, Telecommunications Services of Trinidad and Tobago (TSTT), and the Unit Trust Corporation. In April 2017, we received a Certificate of Recognition and Appreciation and monetary award from the J B Fernandes Memorial Trust II. Equally important are the Mentors who support our YE’s. During 2017, we worked more closely with them to improve the quality of our support and strengthen our acknowledgement and appreciation of their contributions. Financial strength is fundamental to YBTT’s ability to sustain its progress. In 2017, we continued to enhance our loan portfolio management through consistent focus and follow-up. Despite the economic challenges experienced by our YE’s, the overall performance of the loan portfolio improved. Our shift in focus to the provision of enhanced training, mentoring and support services from the start of the YBTT/YE relationship has improved the quality of the loan applications received and the survival rate of their businesses. The 2016/2017 Audited Financials reflect small decreases in both revenue and expenditure that resulted in a more favourable end of year surplus. The fact is that we need, as an NGO, to become more self-reliant and established a Financial Sustainability Board Committee to explore and recommend a way forward. Two key proposals have resulted from consultation among the Directors and staff. Our next steps will be taken as part of our 2018 Key Projects. The game continues! Our Caribbean neighbours, Barbados and Jamaica, have set bold 2020 goals to lead the way in their support for entrepreneurship and innovation. Globally, there is growing interest and investment in support for women and YE’s. Exciting new initiatives aligned with national socio-economic development areas are being crafted and implemented. Support for entrepreneurship development is moving beyond access to the traditional training, mentorship, loans and grants. Innovative mechanisms are being created to provide equity capital, leverage the power of diaspora networks, encourage the involvement of venture-oriented professionals, and explore new types of customer relationships. Academia is pursuing the significant opportunities to support through research and the use of non-traditional learning and evaluation methodologies. Stakeholder networks are expanding as all the parties – private, public, academic and non-profit sectors – move beyond collaboration to co-creation to design, build and sustain entrepreneurial ecosystems appropriate to the unique characteristics and perspectives of each country. In Trinidad and Tobago our entrepreneurship development playbook is still in its earliest stages. It’s time now for us as a country, as powerful stakeholder groups and as individuals to get off the sidelines. We must recognize that our skepticism and negativity is rooted in fear and start trusting in our talent, our resourcefulness, our creativity and the power of co-creating the future of entrepreneurship. Let us seize 2018 as our year to accelerate and intensify our efforts to remove the blocks that diminish our untapped potential so that we open the way to new possibilities. YBTT chooses to stay in the game! We understand that to do so means we must continue to be relevant, focused, open to opportunity, unafraid of risk, curious to learn and, above all, driven and fuelled by our passion and belief in the tremendous value that we can contribute to our YE’s and our country. We resolve, therefore, to ourselves model the entrepreneurial mindset, the responsibility and accountability that we want to see from our YE’s and all the stakeholders. Going forward, we resolve to advance entrepreneurship positively and courageously, strengthening our YE’s to achieve their highest potential levels of personal growth, business success, sustainability, and national impact. To taking entrepreneurship to the next level in 2018 and beyond!